MOORESTOWN—If you’ve noticed that Moorestown’s Main Street is looking better than ever, it is partly because several area businesses have made a commitment to enhance and maintain the appearance of the busy corridor. Beechwood Landscape Architecture and Construction played a significant role in the project when they donated their expertise and materials to design and plant four large beds on the north side of the street near the Pie Lady Café. 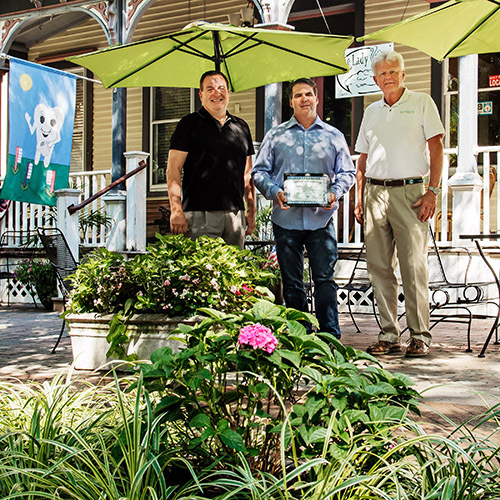 As part of the Moorestown Business Association’s ongoing effort to recognize local businesses that make an extra effort to improve the community, Beechwood was selected by the MBA to receive a ‘Spotlight Award’ for their hard work and dedication to help beautify the town core. Beechwood got involved when the company’s president Steve Chepurny responded to the ‘Adopt a Planter’ appeal from the MBA, an initiative inviting local businesses to participate in a Main Street improvement project. Chepurny, whose company specializes in full-service landscape design and construction, was delighted to get involved. A long-time Moorestown resident, Chepurny not only had the expertise to make a meaningful contribution, he’s committed to helping Moorestown maintain its charm and appeal. Beechwood designed the areas to have different seasonal interest and color, and made a point to use low maintenance, hardy plants such as spirea, hydrangeas, liriope, coral bells, dwarf grasses, and spiderwort. Chepurny launched Beechwood Landscape Architecture and Construction in 2006 after working many years for a large regional landscaping company. Headquartered in Southampton, Beechwood became an MBA member right away and services properties all over the township and throughout Burlington County. Amid a very busy schedule, the beds on Main Street still get Chepurny’s attention. Along with the nearby shops and other town organizations, Beechwood employees regularly come by to water and tend the plantings.